We talked briefly in class today about the major considerations for roofing and siding materials for our tiny dawg house. The 6 main realms of concern are: cost, energy efficiency, carbon footprint, weight and aesthetics. For our class, ease of installation, or more specifically, level of skill required to install, adds another dimension to the discussion. We have a few offers for ffree roofing materials, but before we decide, I wanted to see if anybody (students in the class or anyone else visiting our site) had ideas on suitable materials to use. Today, at this moment, we are seriously thinking of using what is called an AG Panel for both the roof and siding, but break up the the metal siding by using cement fiber panels above and under the windows, painted a cheery color. 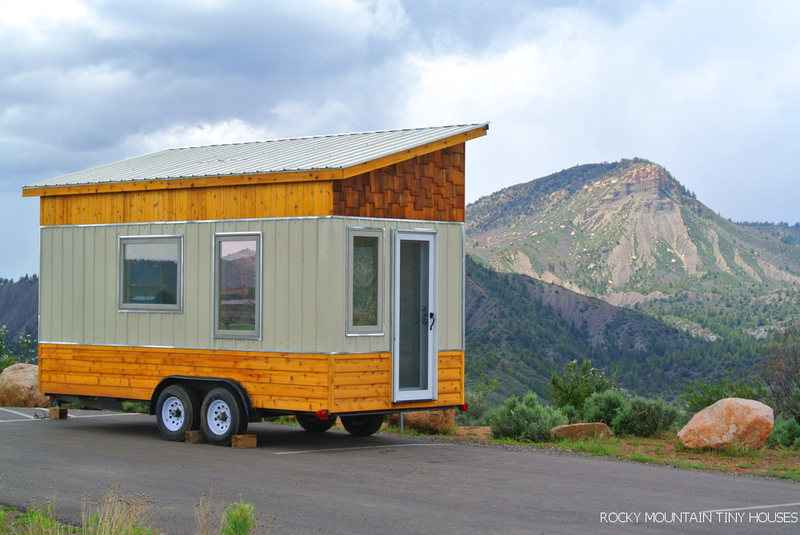 The pic below is from the Rocky Mtn Tiny House website (http://rockymountaintinyhouses.com/) and shows an AG panle roof, AG panel siding with what appears to be cedar shakes. Our current design calls for something similar, but with the concrete fiber panels and in a different pattern. The AG panels offer many positives for both roofing and siding, but there is a concern of making our tiny dawg house look too much like a tin can. And to be honest, I can not speak intelligently about the “greeness” of AG panels or the cement fiber board. Both of these materials seem to fit the requirements at first glance, but this is where we need help. Please share your thoughts and ideas by commenting on this post. Interesting considerations, David– I don’t know much about the issue, but I assume that “regular” asphalt shingles have some sort of petrochemical footprint that makes them less suitable? Do you have any links to images or info on AG panels? Myself (Taylor), Victoria, and Isabelle came to a conclusion during class that our main concern is the entire house (roof and siding) being a metallic silver and the house looking cold and uninviting. We thought that the onduvilla material would be great for the roof in the sense that it would provide a good contrast to the metal siding. The concrete fiberboard panels are a great idea in our opinion, to add dimension to the home. We thought that perhaps we could paint the metal ourselves a warm and inviting color, saving on costs? Basically, as long as the whole house doesn’t look like a big metal toaster, we are open to most materials, as long as there is some freedom in color choice. A UGA class is building a Tiny House and learning many things along the way. Follow their progress @ https://tinydawghouse.wordpress.com/. Personally, I am fine with the use of AG panels for both the roof and siding. I think the metal panels provide the shelter necessary while remaining a light weight. And you can’t beat free. Looking at Taylor’s post, I believe coloring the AG panels would help it look better, and I’ve researched a few eco-friendly metal primers and no-VOC acrylic latex paint. I also looked into the ‘greenness’ of the metal panels as our roofing. I’ll post the link, but it seems they are a decent option because of their ability to last for a long time a be recycled after use. The photo you posted is one that I also came across when searching for siding options. I like that design in particular because it creates an eye-catching and appealing look while also breaking up the walls into distinct sections. At the risk of making it look gaudy or busy, we could consider different colors for the metal siding and different wood options as well. Maybe even consider different wood treatments too. Also, since this is our first tiny house, we are likely to make decisions that we’ll learn later could have been better. I agree that we don’t want just a big metal box, but we also don’t want to exhaust ourselves looking for the perfect solution. I agree with Taylor that our main concern is for the tiny home to look like a cookie sheet. I think the onduvilla roofing material is beautiful but I can see where you guys are coming from for it not last long or doing it’s job. I think if it were possible to paint the metal different colors, I wouldn’t be opposed to that. I believe we should use products that are free of cost, and already on site. Here we are not having to pay anything for our roof, and we are not wasting any materials. However, the look of our tiny house is very important. I agree with the recent comments about not having a house strictly made out of metal. I think we should use the metal roofing that we have at the job site, and the hardie board siding.